We can’t say no to tacos. Who can resist their luscious combination of corn tortillas, spicy chilies, savory meat, and cheese? In the US, most people seem to favor ground beef for taco filling. But we prefer to use Mexican-style braised beef that’s been shredded. The flavor is deeper, plus the shredded meat has a more interesting texture. And what about the tortillas? Well, we love the crispy Hard-Shelled Tacos that are a tradition in many Tex-Mex restaurants. But given a choice, we’ll take soft tacos any day of the week. With soft tortillas, you don’t have to worry about the taco shell shattering when you take your first bite (there’s nothing messier than a taco that disintegrates in your hands). More important, when making soft tacos, you can use your own Homemade Tortillas. Freshly baked tortillas are amazing, and we grab any opportunity to use them. So soft tacos give you wonderful flavor and loads of zip in an easy-to-eat package. Don’t you love the taste of Mexico? Tacos are endlessly versatile, and you can use almost any ingredient as the filling. If it sounds good to you, it probably will be. We have a special fondness for beef tacos, so that’s what we’re featuring here (but we give some alternative suggestions in the Notes). There are two parts to this recipe. First, you need to prepare the shredded beef. Then you assemble the tacos. For that you’ll need corn tortillas, preferably homemade. But if you don’t have those on hand, store-bought tortillas will work fine. BTW, homemade tortillas are thicker and sturdier than the commercially made variety. So if you’re using thin store-bought tortillas, you may want to use two for each taco to make sure everything holds together. Cooking time for the shredded beef is about 1½ hours, and you can do much of the cooking ahead of time (see Notes). Assembly time for the tacos is a few minutes. This recipe yields about a dozen tacos. Leftover shredded beef will keep in the fridge for a few days if stored in an airtight container. Cut the chuck roast into squares of 1 inch or so. Add the beef pieces to a 3- or 4-quart cooking pot. Peel the onion, then cut it in half. Slice half the onion thinly, then add it to the cooking pot (reserve the other half for Step 6). Peel the garlic cloves, then slice them thinly. Add the garlic slices to the cooking pot. Add enough water or beef broth to the cooking pot to just cover the beef (see Notes). Add salt. Bring the cooking pot to a simmer on the stovetop, then gently simmer for 1½ hours (until meat is tender). When done, allow the meat to cool in the cooking broth. When cool, remove the beef from the broth and shred it with two forks. (If you’re preparing the beef ahead of time, you can stop at this point and store the beef until you’re ready to use it—see Notes). Heat the lard or olive oil in a large frying pan. While it’s heating, chop the reserved ½ onion. Add the onion to the frying pan and cook until it’s soft but not yet translucent—3 to 5 minutes. Add the shredded beef and sauté until it’s brown and crispy (a few minutes). Taste, then add salt if necessary. At this point, the beef is ready to be used in tacos. Gather the tortillas and other ingredients, then complete the prep work: Chop the chilies, tomatoes, and onions. Shred the cheese. Chop the cilantro (if using). Unless the tortillas you’re using are freshly made, you’ll need to warm them (so they’ll soften). The easiest way to do this is to sprinkle a clean towel with 2 or 3 tablespoons of water. Wrap the tortillas in the towel, then microwave them for 2 or 3 minutes until soft. To assemble each taco: Lay a softened tortilla (or two) out on your kitchen counter. Then add a tablespoon or so of each filling ingredient—shredded beef, greens, chile peppers, tomatoes or salsa, onions, and shredded cheese. Sprinkle on a little cilantro, if using. Repeat until you’ve used all the tortillas. When assembling the tacos, feel free to pick and choose the ingredients you want as the filling. We usually make each taco a bit differently—some without tomato, some without salsa, some with more greens, etc. You can serve the tacos flat on plates or rolled up. 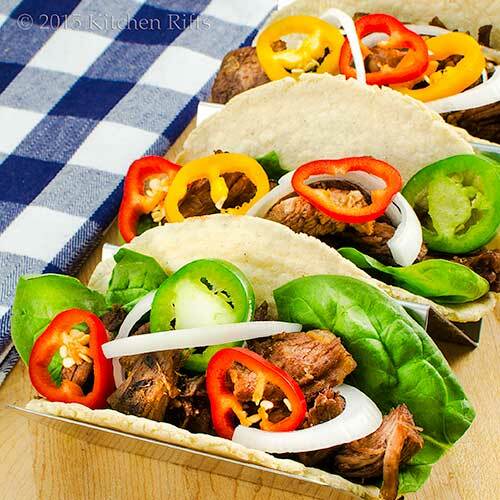 Or you can serve them in taco holders, which can accommodate several assembled tacos (see top picture). If you want to prepare the beef ahead of time, just pause after Step 5 of the Shredded Beef Procedure. Place the cooked beef in an airtight container, then cover it with the cooking liquid (to keep the meat moist). Refrigerate the beef if you’re not planning to use it immediately. When you’re ready to prepare the tacos, drain the beef (and warm it briefly if necessary). Then continue with Step 6 of the Procedure. BTW, you can also freeze the shredded beef (in its cooking liquid, to keep it moist). In fact, we like to double or triple this recipe, then do exactly that with the extra beef. You can use this shredded beef in enchiladas, quesadillas, gorditas—almost any Mexican dish that requires beef. We’ll be using the same basic shredded meat preparation next week for an enchilada recipe, although we’ll finish the meat (Step 6) in a different manner. If you prefer pork in tacos, just substitute pork for beef in this recipe—and prepare it exactly the same way. For an alternative filling, you could try shredded grilled chicken (or rotisserie chicken) or fish. Both make wonderful tacos. For a vegetarian taco, use Mexican-style beans as a filling. If you want to serve soft tacos for breakfast, just fill them with scrambled eggs and sausage. Lard is the traditional fat for Mexican cooking. But if you don’t want to use it, olive oil makes a good substitute. We like to use Kosher salt in our cooking. Because it’s coarser than table salt, it’s less salty by volume. So if you use table salt, reduce the amount by about half. The level of water or beef broth you use (see Step 4 of the Procedure for shredded beef) isn’t critical. You want to cover the beef while it’s cooking, but it’s OK if the tops of some pieces aren’t completely submerged. The meat will have better flavor if you use beef broth, but water works OK.
Tacos originated in Mexico, and traditionally were made with soft tortillas. Hard-shelled tacos were developed in the US during the 20th century. They were put on the culinary map by businessman Glenn Bell, who eventually founded Taco Bell—a fast-food chain found throughout the US. “Holy guacamole, that was a terrible joke,” said Mrs K R.
Guess now is not a good time for enchilada puns. What a great dish -- both for lunch and dinner (or for a snack as well). Although I am not a fan of Mexican cuisine, I do enjoy some dishes such as soft tacos. These beef tacos look so appetizing! I'd not hesitate to devour more than one. This looks yummy. I love beef tacos, but I have yet to try shredded beef. Thanks for the tip! Hi Taruna, aren't homemade tortillas wonderful? Perfect in this dish! And lamb would be superb! Thanks for the comment. Hi Denise, you forgot breakfast. ;-) These really are good any time of the day. Thanks for the comment. HI Liz, shredded beef really make a nice taco -- worth trying. Thanks for the comment. I am back and lovin this dish. I enjoy Mexican food as well as Tacos, and I agree the soft ones are better. I like the hard taco shells in chips with Salsa or Guacamole. Another favorite of mine is enchiladas. But your homemade "Shredded Beef Soft Tacos" is very mouthwatering. I could use one of these goodies! What is good about these is that you can add anything you would like to them. I enjoyed and laughed when I read Loco Motion, you and Mrs. K R are really too funny. Love this thanks for sharing....enjoy the week..I have to see your last post..have not had a chance to read it yet. I have lost my taste for ground beef, but roasted/shredded is delish. Tortillas have been on my to-do list for a while. Looks like I need to get going on these. I don't eat beef, but I can very well imagine how delicious these must be. The colors are so crisp. My hand is raised John - yes I love the flavors of Mexico! I've never loved ground beef so this recipe really appeals to me. Love soft tacos! Hi Rocquie, the beef is wonderful, but in truth the other ingredients taste even better! Funny how it works like that sometimes. ;-) Thanks for the comment. Hi Dottie, welcome back! We love enchiladas too, although we're more than happy with tacos. ;-) Thanks for the comment. Hi GIGI, we know how much you enjoy beef! ;-) Thanks for the comment. Hi Madonna, we find that when we grind our own meat it's pretty good, although really prefer the shredded beef in this dish. ;-) Thanks for the comment. HI Minnie, almost any other meat (or beans) would work really well in this dish. And don't you love the colors? My favorite part of the dish! Thanks for the comment. Hi Tricia, soft tacos really are nice, aren't they? My favorite! Thanks for the comment. Tacos are such a great weeknight dinner. So easy, and you can customize them to however you like. It's a perfect way to satisfy even the most finicky of households. Hi Carolyn, tacos are the perfect quick meal, aren't they? Easy to put together, and so tasty! Thanks for the comment. Hi Nee, so nice of you to drop by when you're so busy! Nothing easier than tacos, is there? Well, except for take out. ;-) Thanks for the comment. Tacos are one of our most favorite foods in this household - we love them and have all kinds of varieties we like. These look super tasty, John! Soft tacos are where it's at. Manservant would love shredded beef! I think I would like to be at your house for Cinco de Mayo. And I would really like to hear those enchilada puns! They look delicious, John! I used to like the hard shells but I agree with you all the way on the soft shells now, they are so much better, with no shattering, like you say. There are many Mexican restaurants by us, but one serves tacos with shredded beef that is really very good. I've never tried that at home, but want to now after reading this. And, lard and tacos for breakfast, works for me. Thanks for the recipe and tips! I can just imagine the puns that fly past during every meal at your place. We love tacos too. John loves the hard shell and I'm more a softie. He'd love these after the first bite. Love both types of tacos, but I am in the crispy camp if forced to choose. I love that you changed yours up a bit with the arugula and spinach additions. I can't wait to give that a try. These look delicious. Hi Amy, tacos are up there in our house too. Best thing about them is you can make a taco out of virtually anything! So versatile. ;-) Thanks for the comment. Hi Abbe, don't know what we're doing yet for Cinco de Mayo, but it'll definitely involve tacos. And enchiladas. And probably Margaritas. ;-) Thanks for the comment. Hi Pam, I really like shredded beef in tacos (or anything Mexican). I like ground beef too, but the flavor just seems better with the shredded beef. Thanks for the comment. Hi Maureen, we do have fun conversations. :-) And we'd definitely fry up some hard-shell tacos for John! Thanks for the comment. Hi Bam, oddly enough we've never used shredded beef on a taco salad. Need to do that -- it's a natural. Thanks for the comment. Hi Karen, we'd never do only soft tacos or hard-shell -- love to have choices! They're both so good. :-) Thanks for the comment. Those are some beautiful tacos John! Love your pictures!!! This summer I attended a chat amount 4 local chef about "tacos". Someone asked "What makes a taco a taco?" The answer was unanimous - "good tortillas'! I'm with you on soft tortillas and homemade of the best. I'm not sure how you could stuff all of those awesome ingredients in a crispy tortilla. Great tacos! Hi MJ, there's probably too much stuff in those tacos! But it's all good. ;-) Agree it's the tortillas that really make tacos. Thanks for the comment. Hi Charlie, those taco holder are really nifty! We saw one in a restaurant, so of course we had to get some. Thanks for the comment. Word play at its finest, once again Mr and Mrs KR! And Julie is missing Mexico because of your tacos! That shredded beef looks really tasty! 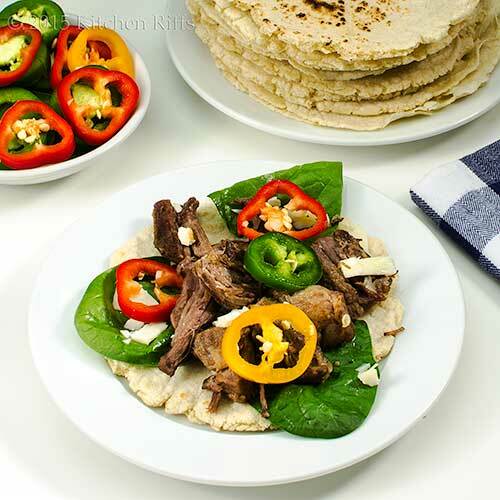 Your 100% homemade beef taco look fantastic! I'm impressed that you even made your own tortilla. Hi Julie & Alesah, the shredded beef is dynamite! Really worth trying. ;-) Thanks for the comment. Hi Zoe, these are so good! Love them. And making tortillas is loads of fun and easy. And really so good in tacos. :-) Thanks for the comment. I love tacos, and these sound great. What enticing photos. Bravo! Hi Liz, ground beef is good, but shredded beef has so much to offer! Really worth trying, at least once. ;-) Thanks for the comment. Hi Kumar, sorry about that hunger thing -- one of the problems with reading food blogs, isn't it? :-) Thanks for the comment. Hi Adri, tacos are so tasty, aren't they? Real favorites of ours! Thanks for the comment. couldn't agree more: we much prefer shredded beef (or chicken) over crumbled ground beef for tacos any day of the week. there's something much more luxurious about it (and way less messy b/c the meat doesn't fall out while you eat them). Looks perfect! I can't say no to tacos - ever!! And corn tortillas are a MUST so I'm excited to try this one! omg you're after my own heart with all those colorful hot peppers! Tacos are always a good idea all year around, especially when there are vibrant peppers involved! I make all kinds of tacos - ground beef, steak, salmon. Now I can't wait to try these! Delicious recipes and painful puns. No wonder I love this blog! YES, always prefer the soft or the hard taco for the very reason you mentioned. I don't use shredded beef, BUT your reason for your preference seems most logical. I might become a shredded beef convert. Wow my friend, you really had to dig deep for the puns this week. But I am such a pun lover, I am laughing as usual. Hi Shannon, hadn't thought about it, but you're right that shredded meat falls out of a taco much less than ground! Another reason to prefer shredded. ;-) Thanks for the comment. Hi Ashley, tacos are great, aren't they? One of our favorite meals. ;-) Thanks for the comment. Hi Katalina, how nice to be able to travel to Mexico! Have a great time! And thanks for the comment. Hi Sue, those pepper are really pretty, aren't they? Not to mention tasty. ;-) Thanks for the comment. Hi Judit, vibrant peppers are always good, aren't they? We just love their big flavor! Thanks for the comment. Hi Laura, tacos are so great because you can put almost anything in them. Really, really versatile! Thanks for the comment. Hi Beth, those puns really are pretty painful, aren't they? Glad you put up with us! ;-) Thanks for the comment. Hi Carol, we really did have to dig deep for puns this week. We enjoyed it, but those were pretty marginal, I must admit. Thanks for the comment. Hi Greg, tacos taste great, of course, but I agree it's their "pretty" factor that's the most interesting part of them. Thanks for the comment. Hi Juliana, they really are good! 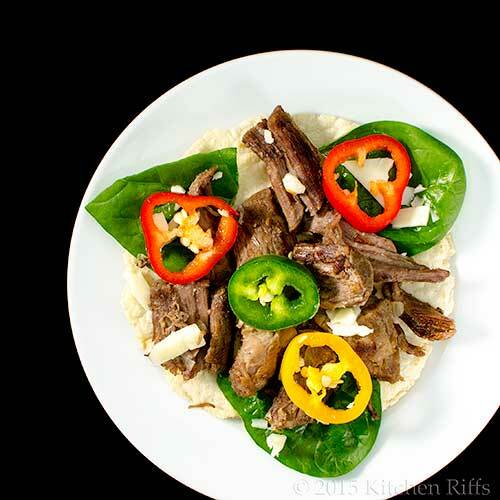 Shredded beef is amazing stuff, and tacos are, well, tacos. ;-) Thanks for the comment. John, you've done these tacos up nicely! I'm with you - shredded braised beef any day, regardless of soft or hard shell. Hi Brooks, love shredded beef! Although I certainly won't turn up my nose at ground beef. ;-) Thanks for the comment. I adore soft taco's and with shredded beef can only imagine how wonderful it would taste. I absolutely love that you posted this! That does it, I need a taco stand. No, not a place to peddle street food, something like that stainless steel number holding your tacos at attention -- I need one of those! Looks delicious, as always, John. Hi Pat, we really like corn tortillas -- so much character! But the flour tortillas tend to be bigger, which has benefits, too. Thanks for the comment. HI Amanda, aren't soft tacos wonderful? But then, any taco is wonderful! :-) Thanks for the comment. Hi Candy, glad you like it! Thanks for the comment. Hi Judy, those taco holders are really nifty! We had seen them at restaurants, and were smitten. ;-) Thanks for the comment. Homemade tacos from the ground...errr...tortilla up are soooo good! Once you have one of those, restaurant tacos just won't do! Tacos are the best and you can never go wrong with all the goodness stuffed in. Home mode tacos are some of the best and those soft tacos, wow. You just reminded me to have a taco night at home. I can never say no to tacos either, and yes, I love the taste of Mexico! I've still never made tortillas, and I really need to do it. I guess it's a little like Parisians never baking their own baguettes at home. Still, I want to make some tortillas! Hi Pamela, one's own tacos are so good, aren't they? And so much fun to make! Thanks for the comment. Hi Asha, always fun to have a taco night, isn't it? One of my favorite dinner! Thanks for the comment. Hi Lisa, you can probably buy really, really good tortillas in loads of places! Most of us can't. ;-) But they're fun to make -- definitely worth trying. And I did make my first ones when we lived in Texas -- loved the inspiration. Thanks for the comment. I've never made homemade tortilla nor have I had tacos with shredded beef!!! so this will be considered a whole new experience for me.. loved the idea and will try this for sure. Thanks. uh uh, guess I'm a bit behind with my feed... I just left a comment on the tortilla post about waiting for these tacos. I ask for them, and they're here, haha! Love these! Thank you so much for this recipe! I totally love tacos! Mexican food is so delicious...! Hi Amira, once you get the hang of making them, tortillas are really easy to make. And making tacos becomes a snap! ;-) Thanks for the comment. Hi Paula, you ask, we deliver. :-) Thanks for the comment. Hi Marcela, isn't Mexican food the best? We love the stuff! Thanks for the comment. I'm with you, you can't beat a shredded beef taco. And I've been looking for taco holders like that. Thanks for the reminder that I need to keep looking. Can't find any. Hi Lea Ann, we got those taco holders from Amazon. They have several different ones to choose from. Thanks for the comment. Love that taco holder - such a smart idea! Hi Alyssa, isn't that taco holder fun? Such nice presentation! :-) Thanks for the comment. Oh my gosh, I am into tacos lately and anything wrapped. This looks so delicious! Hi Peachy, tacos are wonderful, aren't they? So many different things you can put in them -- and I love making every one a bit different. ;-) Thanks for the comment. I love tacos. This one looks especially delish. Hi Lux, aren't tacos good? And shredded beef ones are particularly nice. ;-) Thanks for the comment. Hi Shashi, :-) Love it when dinner is to tasty, and relatively easy! Thanks for the comment. Hi Raymund, me too! Need to make them again. :-) Thanks for the comment. I love the shredded beef in these taco. I believe that I would prefer the shredded beef too. Hi Dawn, this shredded beef has such great flavor! Really like its texture, too. Thanks for the comment. I couldn't agree more with you that shredded meat tastes so much better. This is a fantastic taco version and I'm so going to prepare this next weekend. Hi Daniela, isn't this nice? Loads of flavor, and so much fun to play with different ingredients as you put together your tacos. ;-) Thanks for the comment. Your tacos are making my mouth water. Shredded meat, or chopped up, is how we Mexicans actually eat are tacos. The ground beef thing is strictly American. :) Great tip on the tortillas too, John. HI Nancy, I like both ground and shredded beef in tacos, but the texture (and flavor) in shredded really is superior. ;-) Thanks for the comment. Sounds wonderful! We eat tacos at least once a week at our neighborhood place usually between shooting videos. I almost always order the same thing, al pastor with soft corn tortilla. Maybe because we go to pretty authentic Mexican place...I didn't know some places serve ground meat - it would have been easy for my kids to chew meat when they were young! I remember it was always hustle cutting meat with fork and knife back then. :D I have to eat tacos today!!! Lunch in one hour... :) I'll come back for this recipe when we have our kitchen back! Hi Nami, I love tacos al pastor! We actually had some pork tacos for dinner last night -- now you have me thinking I need to do al pastor ones, and soon. ;-) Thanks for the comment. Oh, I need to make these tacos very soon! 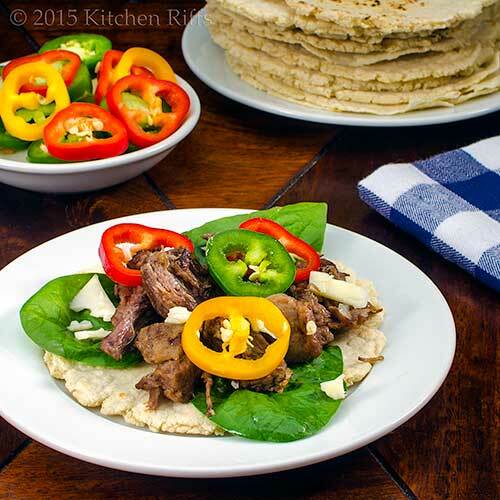 Shredded beef is the best by far, especially in homemade tortillas. Thank you for the inspiration, John! They look mouthwatering! Hi Hannah, these are really good! We need to make them again, soon. :-) Thanks for the comment. I don't know about other people but I know I can't resist these tacos! It's delicious and bursting with flavors! Yummy! Hi Maureen, who can resist tacos? ;-) Thanks for the comment. Made this last night. SO GOOD! Used leftover beef to make freezer burritos. Thanks for this brilliant recipe John! Hi Nagi, isn't this really good stuff? Deep flavor. ;-) Thanks for the comment.